Open to everybody, The Ethics Café is an inclusive community dialogue, asking you to join the discussion on today's most difficult questions. No answer prep is necessary, and how you choose to participate in the discussion is up to you! 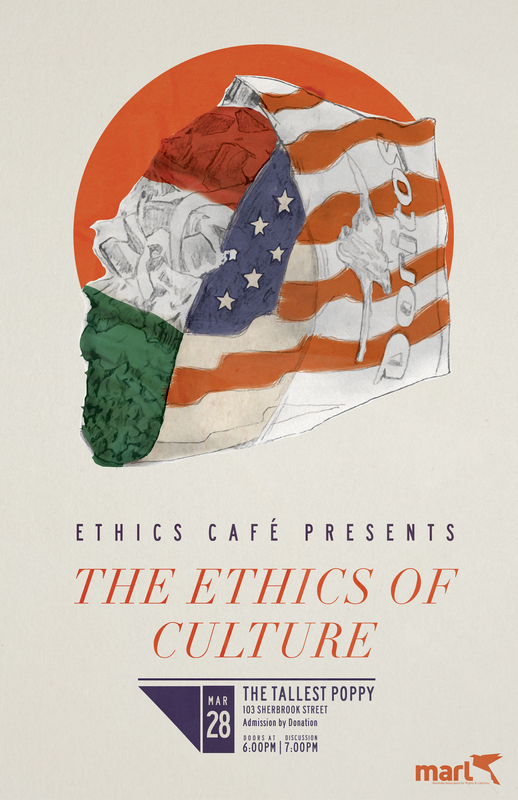 This time, we'll be discussing the Ethics of Culture. What is culture, how is it defined, and who decides? What is cultural appropriation, and why does it happen? Where are our sources of culture, here in Canada? What is the influence of Western/American culture? What is defined by 'multiculturalism'? These, and more, may be some of the challenging questions we tackle at this discussion in a fun and friendly setting. Doors open at 6PM, Discussion begins at 7PM. Entry by donation to MARL, though no one will be turned away due to lack of funds. Stay tuned to find out who our Community Expert facilitating the discussion will be. Thanks to our event partner, the University of Manitoba Centre for Applied and Professional Ethics for their continued partnership. Find the Tallest Poppy's menu and more info here! The Tallest Poppy is located on the first floor, and has two doors to enter the restaurant. The front entrance and washrooms are physically accessible. All washrooms are gender neutral. Our event takes place around tables in a seated discussion, and there are typically chairs for everyone. Please email connect@marl.mb.ca or phone 204-946-0905 with any concerns or questions.